"Go outside and play" was a statement heard on every street across America growing up. To play outside meant getting dirty, and getting a drink meant taking a sip from the garden hose. Flash forward…"Go outside and play" has become "Did you wash your hands?" Providing sanitary conditions is a must where children interact with outdoor spaces. The economical appeal of the new Model 625 makes sanitary conditions an attainable goal. The Model 625 is available in the customer's choice of 17 standard colors. Not only will the HandWash Station improve sanitary conditions, but the quality and structure of the unit are sure to be a positive addition to any outdoor space. Montage®, the new generation of ornamental fencing, is changing America's landscape. Unparalleled quality, now affordable through new technology and manufacturing processes, has made Montage the number-one choice of site managers across America for both new fence construction and replacement of existing wood, chain-link or PVC fences. Commercial and residential properties now have a high-quality, competitively priced welded ornamental fence system to replace unsightly and vulnerable chain-link fences. The popular Montage Plus® Fence System has been taken to the next level, 7- and 8-foot tall fencing in several styles: Majestic flush top-rail, Classic extended pickets, and Invincible outwardly-curved spears. Dispoz-A-Scoop® Dispensers keep facilities clean and family-friendly. Dispoz-A-Scoops replace the gross "warm handshake" of the old-fashioned baggies with a sanitary, civilized experience. Dog owners are happy to clean up whenever cleanup means no touch, no mess and no odor. You simply scoop, push down to seal and dispose. Facility managers receive fewer complaints, and the community is able to share and enjoy cleaner parks and trails. Dispoz-A-Scoops are eco-friendly, made with recycled materials, and 100 percent USA-produced. Lynkris casual furniture is hand-crafted specifically for commercial use at the company's factory in Sparta, Wis. They offer a complete line of chairs, tables, lounges, umbrellas and linen accessories. All products carry a 10-year frame warranty. If you like to change colors, it is extremely easy to replace the slings. The product has such a long service life, the company started offering trade-ins, so ask about refurbished furniture. Webcoat Inc. has produced high-quality outdoor furniture for over 20 years. Their corrosive-free, maintenance-free outdoor furniture is thermoplastic, PVC-coated steel to ensure you are getting the strongest and most durable outdoor furniture. Webcoat Inc. is now teamed up with Superior International Industries Inc., which provides you with a one-stop shop for all your outdoor needs, including outdoor furniture, playgrounds, shade and shelters. Call for a free catalog of over 1,000 products. The Model-5925 shown here is one of many drinking fountains designed to meet the needs of children, adults and the physically challenged. All are perfect for walking trails, playgrounds, parks, resorts and recreational areas. Stern-Williams offers over 100 distinctive styles: pedestal and wall-mounted drinking fountains, refrigerated fountains, jug fillers, pet fountains, hydrants, foot showers, outdoor showers and misters in powder-coated metal, aggregate or stainless steel. 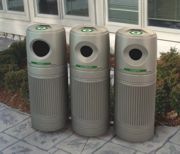 Commercial Zone® Products introduced the new personalized LitterMateTM Recycler. Choose your label and customize each unit to best fit your recycling needs. Bins are designed to connect together with optional hardware kit. Create a complete recycling system as an in-line design or tri-pod design. Recycling bin includes two recycled logos to clearly identify the units as an approved recycling center. Eco-friendly bins are made with at least 25 percent post-consumer recycled materials as well as the cartons. Extremely durable with covered lid to make these units perfect for any outdoor or indoor application. Dogipot introduced its Oxo-Biodegradable Litter Pick Up Bags and Liner Trash Bags. Dogipot's new and improved litter pick-up and liner trash bags are some of the most environmentally conscious pet waste and liner bags on the market, designed to not only help rid parks, recreation areas, campgrounds and RV parks of the unsightly, smelly nuisance of dog waste, but also minimize the environmental impact of bagged and disposed dog waste. There are Dogipot imitators in the market, but Dogipot offers experience, high quality, an environmentally conscious product line, world-class customer service and value.